The 2018 Maruti Suzuki Wagon R has been spotted undergoing tests in India. 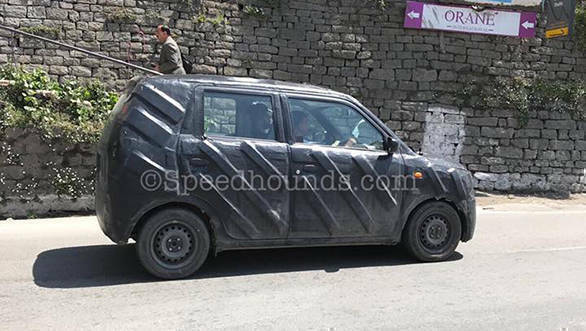 An image of the next-gen Maruti Suzuki Wagon R shows a heavily camouflaged example being tested in Shimla, Himachal Pradesh. The 2018 Maruti Suzuki Wagon R is likely to receive a host of upgrades, which include a facelift to its dated styling. The new Wagon R will also receive updates to its chassis for structural rigidity as well as mechanical updates to make it compliant with the upcoming BS VI emission norms. The Wagon R is one of the best-selling cars in the country with more than 20 lakh units already sold in the country, and Maruti Suzuki will definitely want to retain that popularity with this new model. The test car in the spy shot continues to have the same tall boy stance as its current iteration, while the large rear windscreen seems to have become smaller on the new one. There is also a hint of lamps on either side of the rear windscreen. The front is not visible from this angle but it appears that the headlamps have more sweptback lines around the top corner. More details about the 2018 Wagon R will be available as it gets closer to production-spec. It is likely that the new Wagon R will debut sometime in late 2018 if not early next year.